Supported by clinical studies (1) and considered the most bioavailable supplement you can buy. .
Combats inflammation and digestive problems. Helps improve biliary and liver function. Antioxidant, immune-modulating and anti-proliferation properties. In LICAPS® capsule form (fast-release, high protection from moisture and oxidizing agents). Curcumin Solution is a high-tech formulation containing curcumin, the most biologically-active ingredient in turmeric. It has been developed to maximise curcumin absorption and to enable its potential to be fully exploited. Numerous studies have demonstrated curcumin’s exceptional properties, particularly in relation to inflammation and mutations that cause cell proliferation. Who is Curcumin Solution aimed at? With its wide-ranging properties [anti-inflammatory (2-4), antioxidant (5), immune-modulating (6), pro-apoptotic (7) and anti-angiogenic (8-9)], Curcumin Solution is designed for anyone who wants to improve their daily life and optimise their health. those who feel they’re ageing rapidly. How does Curcumin Solution differ from other curcumin supplements? Curcumin is an exceptional natural molecule but its efficacy depends on the amount absorbed by the body. Absorption is normally very low due to its instability in acid conditions, poor solubility in digestive fluids and difficulty crossing the intestinal wall (10-12). The advantage offered by Curcumin Solution is that it significantly increases this absorption by micronizing the curcumin and making it soluble in digestive fluids using micelles (microscopic beads that mix easily in water). This is a highly ingenious process: it increases curcumin’s ability to cross the intestinal wall by a factor of 185 compared with standard curcumin. This huge increase in absorption raises the amount of curcumin circulating in, and retained by, the body (curcumin’s half-life is normally very short). By way of comparison, all other strategies employed to increase its absorption are less effective: with the addition of piperine, for example, its absorption is only multiplied 20-30 times (13-14), while incorporating curcumin into lecithin liposomes barely increases it by a factor of four. An independent study has demonstrated that this is indeed the most bioavailable curcumin supplement on the market (15). Taking two capsules of Curcumin Solution a day results in 10-15 grams of curcumin circulating in the body, whereas it would take more than 25 capsules a day (containing 600mg of standard curcumin) to have any chance of reaching these levels. As a consequence, it’s possible to take fewer capsules and spend less money and still achieve an unparalleled level of circulating curcumin. How does curcumin act in the body? Curcumin is the most biologically-active compound in the rhizome of Curcuma longa. It has an impressive number of biological benefits and acts against multiple cellular targets involved in cancer (16), diabetes (17), cardiovascular problems (18-20), neurodegenerative diseases (21), rheumatism (22), etc. Its effects on inflammation and elevated blood lipids have been demonstrated in several animal and human studies (23-25). In particular, it inhibits cholesterol production by the liver (26) and reduces absorption of dietary cholesterol (27-29). But the property which most interests researchers is curcumin’s ability to inhibit the proliferation of cancer cells. It does so by intervening at various points in their development and by stimulating the production of enzymes that facilitate their elimination (30). The problem is that the amounts shown by in vitro tests to be effective are difficult to achieve in the body - which is precisely why Curcumin Solution has been developed – to maximise its absorption. In 2018, researchers took a giant leap forward when they identified the effects of curcumin on a protein involved in cancer cells (31). Note: It’s important to point out that Curcumin Solution 60 Licaps™ is not meant to rival the supplement Super Curcuma 500mg, one of the best products in our catalogue and one which regularly receives high praise from our customers. 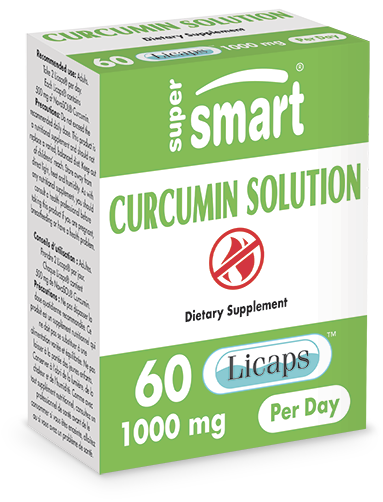 Curcumin Solution 60 Licaps™ is designed more to produce systemic benefits as the curcumin it contains reaches the bloodstream more easily. As far as the digestive system is concerned, Super Curcuma 500mg remains without doubt the best turmeric supplement on the market because it concentrates the curcumin more specifically in this area. 1) Take Curcumin Solution capsules at mealtimes. Curcumin is always best-absorbed when consumed with some dietary fat because fats slow down intestinal transit and increase the micelles’ contact time with the intestinal wall. 2) Increase your intake of omega-3 fatty acids. Omega-3 from oily fish and fish oil have powerful anti-inflammatory properties, but the amounts needed are difficult to obtain from diet alone. It’s therefore better to opt for EPA and DHA supplements (3 softgels a day). 3) Increase your consumption of fruit and vegetables, and at the same time, reduce that of pro-inflammatory foods rich in omega-6 (usually highly-processed foods). 4) Incorporate anti-cancer foods into your diet. The best-known are the red fruits (as they contain ellagic acid, anthocyanidins and proanthocyanidins), citrus fruit (vitamin C, polyphenols and terpenes), cruciferous vegetables (glucosinolates) and alliaceous vegetables (allicin, thiosulfinate, thiosulfonates, monosulfides, disulfides and trisulfides). This new curcumin formulation brilliantly combines modern technology and ancient tradition. Technology, because its development has involved a feat of scientific skill (micro-encapsulation of the curcumin). Tradition, because it maximises the potential of a substance recognised by ancient systems of medicine for at least 4000 years. It’s a timely response to unprecedented global interest and constitutes a perfect way of benefiting from the considerable therapeutic properties of turmeric. Note : this product should not be used as a substitute for a varied, balanced diet and a healthy lifestyle. It’s important to follow the guidelines on how to take it and the recommended dose, and to use it by the ‘best before’ date. It is not recommended for women who are pregnant or breastfeeding, or for children under 15. Keep out of children’s reach. Store in a cool, dry place. Jurenka, J. S., Anti-inflammatory properties of curcumin, a major constituent of Curcuma longa: a review of preclinical and clinical research. Altern. Med. Rev. 2009, 14, 141–153. Dal Piaz F, B. A., Belisario, M. A., De Tommasi, N., Thioredoxin system modulation by plant and fungal secondary metabolites. Curr. Med. Chem. 2010, 17, 479–494. Karlstetter, M., Lippe, E., Walczak, Y., Moehle, C. et al., Curcumin is a potent modulator of microglial gene expression and migration. J. Neuroinflammat. 2011, 8, 125. doi:10.1186/1742-2094-8-125. Belakavadi, M., Salimath, B. P., Mechanism of inhibition of ascites tumor growth in mice by curcumin is mediated by NF-kB and caspase activated DNase. Mol. Cell Biochem. 2005, 273, 57–67. Anand, K., Sarkar, A., Kumar, A., Ambasta, R. K. et al., Combinatorial antitumor effect of naringenin and curcumin elicit angioinhibitory activities in vivo. Nutr. Cancer 2012, 64, 714– 724. El-Azab, M., Hishe, H., Moustafa, Y., El-Awady el, S., Antiangiogenic effect of resveratrol or curcumin in Ehrlich ascites carcinoma-bearing mice. Eur. J. Pharmacol. 2011, 652, 7–14. Schiborr, C., Kocher, A., Behnam, D., Jandasek, J. et al., The oral bioavailability of curcumin from micronized powder and liquid micelles is significantly increased in healthy humans and differs between sexes. Mol. Nutr. Food Res. 2014, 58, 516–527. Shoba, G., Joy, D., Joseph, T., Majeed, M. et al., Influence of piperine on the pharmacokinetics of curcumin in animals and human volunteers. Planta Med. 1998, 64, 353–356. Vareed, S. K., Kakarala, M., Ruffin, M. T., Crowell, J. A. et al., Pharmacokinetics of curcumin conjugate metabolites in healthy human subjects. Cancer Epidemiol. Biomarkers Prev. 2008, 17, 1411–1417. Golombick, T., Diamond, T. H., Manoharan, A., Ramakrishna, R., Monoclonal gammopathy of undetermined significance, smoldering multiple myeloma, and curcumin: a randomized, double-blind placebo-controlled cross-over 4g study and an open-label 8g extension study. Am. J. Hematol. 2012, 87, 455–460. Chuengsamarn S1, Rattanamongkolgul S, Luechapudiporn R, Phisalaphong C, Jirawatnotai S. Curcumin extract for prevention of type 2 diabetes. Diabetes Care. 2012 Nov;35(11):2121-7. doi: 10.2337/dc12-0116. Epub 2012 Jul 6. Alwi, I., Santoso, T., Suyono, S., Sutrisna, B. et al., The effect of curcumin on lipid level in patients with acute coronary syndrome. Acta. Med. Indones 2008, 40, 201–210. Akazawa, N., Choi, Y., Miyaki, A., Tanabe, Y. et al., Curcumin ingestion and exercise training improve vascular endothelial function in postmenopausal women. Nutr. Res. 2012, 32, 795–799. Khajehdehi, P., Zanjaninejad, B., Aflaki, E., Nazarinia, M. et al., Oral supplementation of turmeric decreases proteinuria, hematuria, and systolic blood pressure in patients suffering from relapsing or refractory lupus nephritis: a randomized and placebo-controlled study. J. Ren. Nutr. 2012, 22, 50–57. Shin, S. K., Ha, T. Y., McGregor, R. A., Choi, M. S., Long-term curcumin administration protects against atherosclerosis via hepatic regulation of lipoprotein cholesterol metabolism. Mol. Nutr. Food Res. 2011, 55, 1829–1840. Babu, P. S., Srinivasan, K., Hypolipidemic action of curcumin, the active principle of turmeric (curcuma longa) in streptozotocin induced diabetic rats. Mol. Cell Biochem. 1997, 166, 169–175. Manjunatha, H., Srinivasan, K., Hypolipidemic and antioxidant effects of dietary curcumin and capsaicin in induced hypercholesterolemic rats. Lipids 2007, 42, 1133–1142. Cancer chemopreventive effects of curcumin. Surh YJ, Chun KS. Adv Exp Med Biol. 2007;595:149-72. Review. NovaSOL® Curcumin, Aquanova AG, Germany. LICAPS™ & logo are trademarks of Lonza or its affiliates.